"I was glued to the edge of my seat with jaw wide open as I read this gem of a book from start to finish, in a single sitting. Putin is amazing! 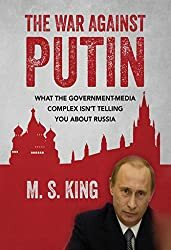 The clarity and simplicity with which King's masterpiece demystifies current events represents a rare ability to speak to the reader with entertaining, understandable prose. This really needs to go viral and fast. 5 HUGE stars!" For a minimum donation of $9, you will receive the full pdf within 2-7 hours. If you can contribute more, it will help us to publicize this important piece. If you can contribute more, it will help us to publicize this important information. If you do not have a Credit Card, you may pay by Cash /Check/ Money Order.